The global algae omega 3 ingredient market records a revenue of USD 431.5 million in 2016 and is expected to grow at a CAGR of 11.5 % during the forecast period of 2018 – 2023. Algae, as a source, accounts for 18% of the global omega 3 ingredient market. The market is highly fragmented with the regional domestic players and the international players. The demand for algae omega 3 is growing at a faster rate in infant food fortification as it provides the same benefit that of fish oil, but it has no off odor or taste. Omega 3 obtained from algae is considered as more bioavailable and sustainable for production which is highly required at present time, where overfishing is a major problem. Another benefit associated with algae Omega 3 is, it is vegan. Moreover, the product quality of algae Omega 3 is superior as compared to fish oil because it is free from any toxic pollutants, and possesses high purity in terms of form of fatty acid, and off sensory properties. The major restraining factor with market is the high cost of product due to higher downstream processing cost. However, with passage of time due to technological advancement, the market can be highly competitive. Commercially, there are two types of essential Omega 3 fatty acid derived from algae: Eicosapentanoic acid (EPA) and Docosahexanoic acid (DHA). DHA holds the largest share in the market due to its high demand in infant formula products and legal recommendations on it. EPA is the fastest growing market supported by the various health benefits, which has increased its importance in drug formulation. By concentration type, global algae omega 3 ingredient market is divided into high concentrated, concentrated and low concentrated product. Currently, low concentrated and concentrated algae ingredient are capturing the market demand. 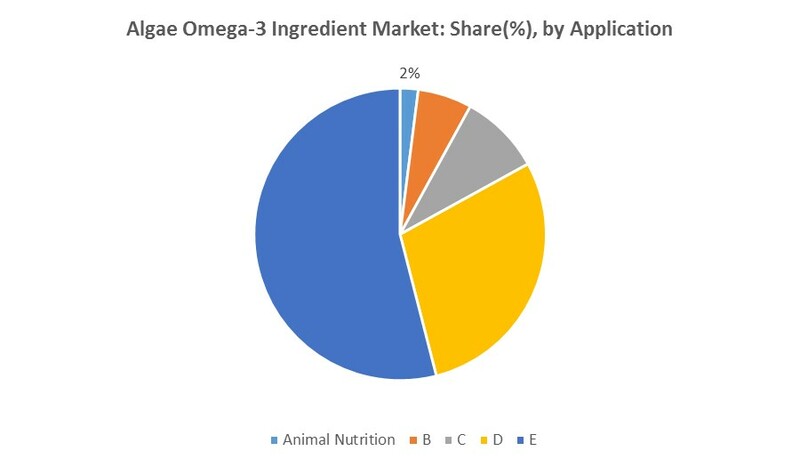 Dietary supplement holds the largest share in the algae omega 3 ingredient market followed by infant formula application. Growing awareness among consumers regarding the daily dosage of Omega 3 has focused the demand of high concentrated products. The use of algae omega 3 ingredient in dietary supplements accounts for the largest share of 53.5% in 2016. Increasing demand by pharmaceutical companies for Omega 3 oils sourced from algae is driving its demand in pharmaceuticals. Animal nutrition is another major growing segment for the market due to increased health concern among pet owners. North America followed by Europe dominates the market. Increased consumption of omega 3 supplements in countries like the US is driving the market in developed regions. Asia-Pacific is the fastest growing region due to growing fortified food market and increased consumer awareness. Japan and China are the significant market in Asia- Pacific captured with major domestic players. South America is another growing market for algae omega 3 ingredient market driven by the high consumption of fortified products. 2018- Startup Triton Algae is bringing healthy and safe non GMO, and vegan algae powder rich in omega – 3, 6, and 9 fatty acids, vitamin A/ Betacarotene and iron. This is an excellent source of high protein. 2017-Nordic Naturals® Introduces Five New Children’s Products. The new products offer concentrated, triglyceride-form omega-3 fish oil in age-appropriate formulations for cognition, learning and attention, mood health, and more, plus a kid-friendly, fast-melt probiotic powder. Some of the key players in the market include DSM Nutritional Products, Bioprocess Algae, Llc, Neptune Wellness Solutions, Source-Omega, Qualitas Health, Nordic Naturals, ADM, Algaecytes, Simris Alg, Algisys, Polaris, Terravia (Solazyme) and Bioceuticals amongst others.